The happy little worker girl! Mom assembled all the ingredients, filled jars, and processed the MANY quarts of salsa. The Lord blessed us abundantly this year with many boxes of tomatoes from the local produce auction and from our garden! Three days of working together resulted in over 100 quarts of salsa! Yum! And the teamwork gets more fun each year as we all get older and can get more done faster.....some of our best sibling times happen in the summer kitchen! "To the end that my glory may sing praise to Thee, and not be silent. O Lord my God, I will give thanks unto Thee for ever." 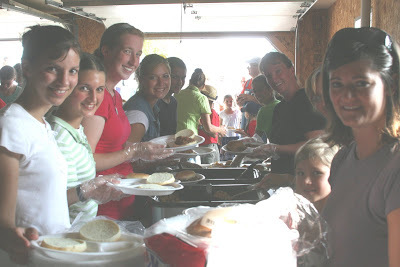 Once again, we are rejoicing in God's goodness which we experienced at Family Camp this year. We certainly agreed with the Wissmann Family that although we didn't feel like going to camp after a rather hectic month and a half of singing, farming, gardening, and preparing for Labor Day (see previous post), we went because we had committed to it and then were so blessed with the teaching of God's Word, the fellowship of dear Christian friends, and the outdoor beauty of God's creation plus some great meals at Village Creek Bible Camp. Here a few of the snapshots of what went on at camp. This is Elizabeth with the youngest member at camp, Lorinda , who was only 6 days old! Congratulations to Tom and Mary Cory on your sweet, precious, and first daughter!! Hudson just couldn't get done riding this horse. Gloria Wissmann shared a Bible Story on the white board with the mothers and daughters. The Greers shared some beautiful music with us one evening. 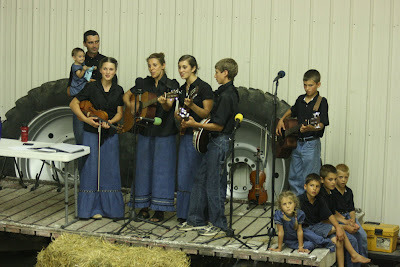 The Wissmanns gave their concert on Sunday evening. We just never get tired of hearing you, Wissmann Family!! A big hit was the breakout session to learn more about playing instruments. We give God all the glory for what He did at camp this year. I certainly learned another lesson in trusting God for whatever He brings into my life and also trusting Him to use it to bring glory to His name. Thanks to all who came to camp this year and for what you contributed. We loved hearing your testimonies of what God is doing in your lives. It is encouraging and inspiring to see God at work in families. Lots of food for 400 people! In the morning we were blessed by the help of many dear friends (the Lincheids & Ethel receive the top award for cutting the most watermelon! Only about 35 watermelon.....:)) Thanks to each of you that made this event possible by your gracious help! We love you all! This sight was so precious....and reminded me (Chelsy) that this picture is really what the "Turning Hearts Celebration" is all about: the family being drawn closer to each other & the Lord. A few of the many people! ........how is it that whenever guys get together, it is just understood that the common interest is football?! 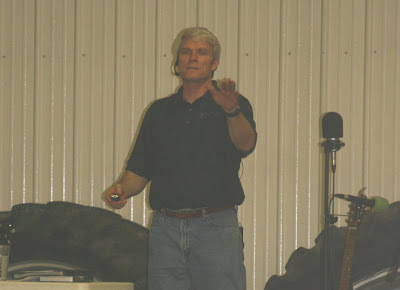 James Yoder kindly offered to run the sound system this year....thanks, Mr. Yoder! Norm Wakefield gave 2 challenging messages that were very inspiring & convicting. 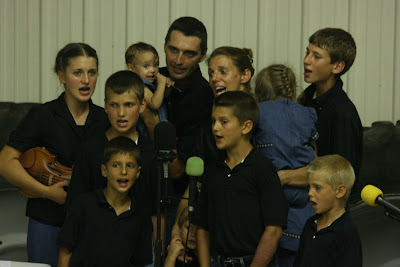 Our family ended the day with several songs.......and thus concluded the 7th Annual Turning Hearts Celebration! God moved in mighty ways and we were once again so blessed to see His amazing work in the lives of so many families who are following with all their hearts after Him! "And He shall turn the hearts of the fathers to the children, and the hearts of the children to their fathers, lest I come and smite the earth with a curse." We hope to see you all (and many more!) next year at the 8th Turning Hearts Celebration! We are back to blogger land. Did anyone miss us? I will try to share the month of August with you with a few pictures. So much has happened.........we sang 23 times at a total of 12 events in western and southern IA. We froze nearly 60 quarts of corn and 30 quarts of peaches; made 45 quarts of salsa; canned 20 quarts of tomato juice; froze 5 quarts of tomatoes; planted lettuce, radishes, kohlrabbi, spinach, and beets, and ate too many fresh cucumbers, tomatoes, and melons to count! We also prepared for our 7th annual "Turning Hearts Celebration" which Chelsy will post about later this week. And there was the usual farm work-milking the cows, feeding the calves, etc. Freezing corn is usually a family project. Our friend, Ben Dorin, was helping out on the farm for a few days so he got in on the action, too. Peeling tomatoes for salsa is also a group effort. While we were in Scranton for the tent meetings, we spent some time with the Hoyt Family and helped them freeze corn. Work is so much more fun when it is done with friends. I'm so glad God made flowers! Allison's dream came true this summer when she finally had enough money saved to buy a horse. Elizabeth and Allison having a "chocolate moment". We enjoyed seeing many local friends at the "Kalona Gospel Sing". Chelsy, Allison, and Elizabeth went to see our friend, Mrs. Hoppe, in North English one afternoon to wish her "Happy Birthday". Elizabeth isn't in the picture because she took it! The boys had a silly moment on the trolley while we were at "Old Thresher's".